Lazies, Get ready to support your bags in a whole new and easy way! 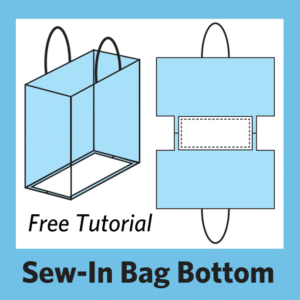 Check out this step-by-step tutorial for creating and installing a bag support during construction, then grab a FREE printable tutorial below. 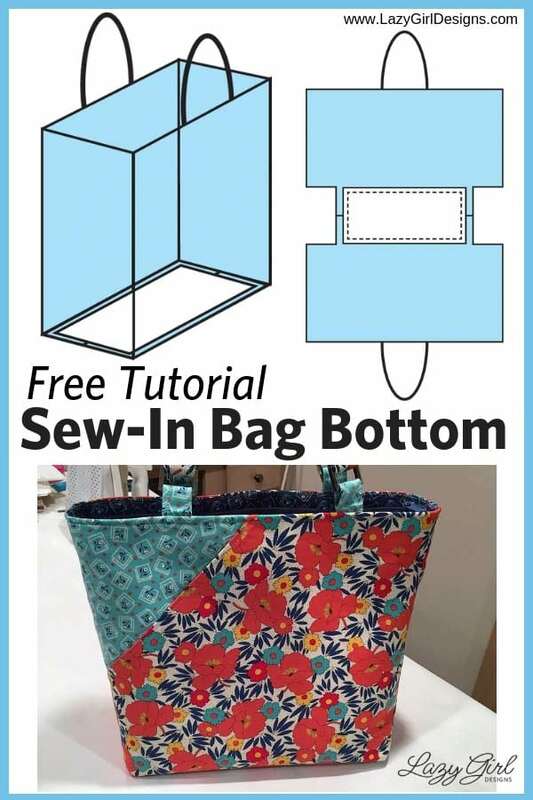 So let’s take a look at this crazy-good and convenient sew-in bag bottom, to support your next bag project. 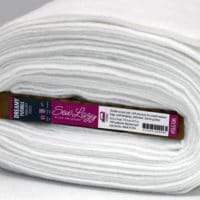 Our Stiff Stuff firm sew-in interfacing SLG107 can be cut to size and sewn directly into the bottom of your bag project for good support to keep your bag from sagging. Stiff Stuff is lightweight, flexible, and yet sturdy enough to offer the support your bag needs. It offers flexibility that our acrylic, rigid, pre-cut Bag-E-Bottoms can’t. That extra line of stitching around the bottom of the bag means there’s Stiff Stuff built in. Stiff Stuff Firm interfacing on the bolt in 20″ width. 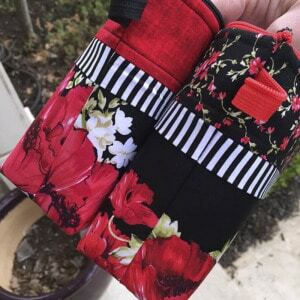 Perfect for medium to large bags, plus sew-in bag bottom support. Item SLG107, SLG10720 from Lazy Girl. 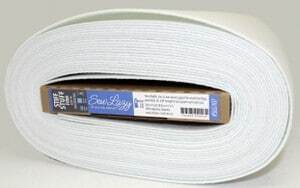 Stiff Stuff Firm interfacing in the 20″ x 40″ package. 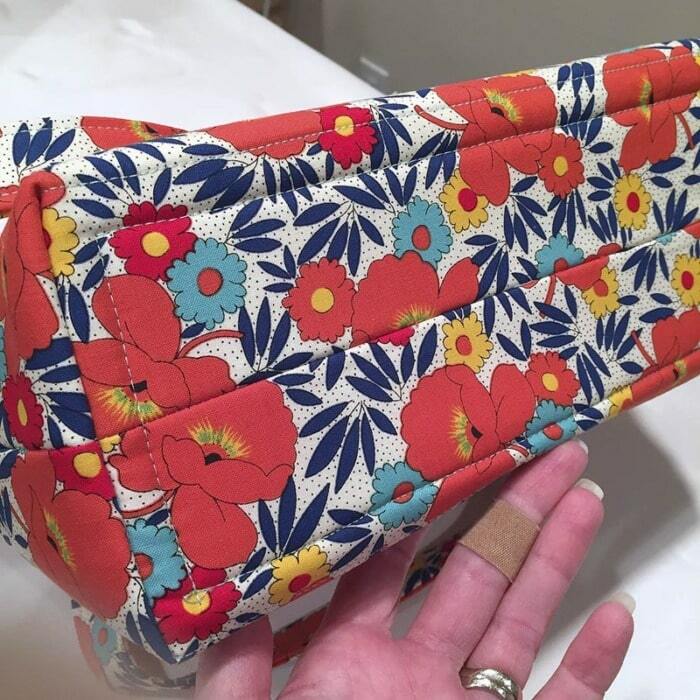 Enough for a medium to large bag, plus sew-in bag bottom support. Item SLG1071 from Lazy Girl. Custom cut and add Stiff Stuff after sewing the bottom seam, but before sewing the side seams. 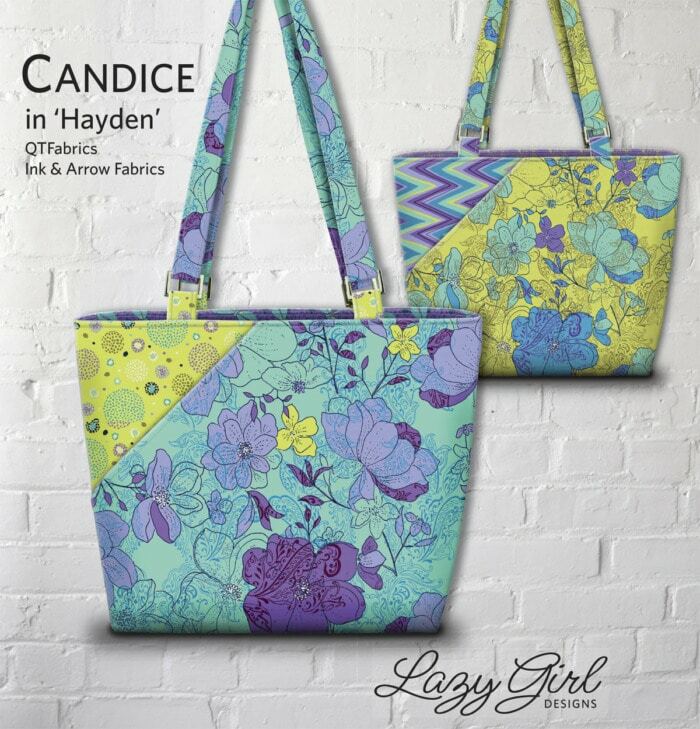 I use our Candice pattern LGD130 in this tutorial. 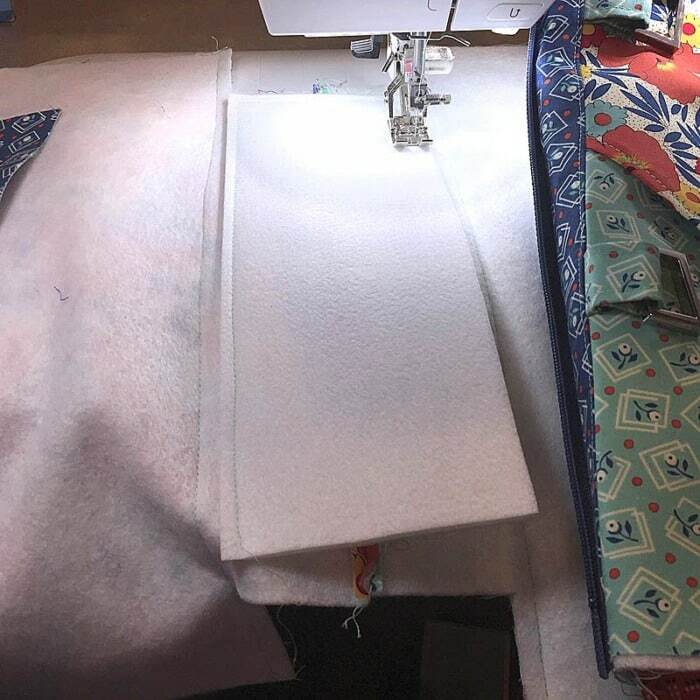 This method will work for bags using my construction technique and bags constructed as bucket in a bucket style where you create the outside bag and inside lining, then ‘stack’ one inside the other and sew along the top edge. Sew the bottom seam of your bag, press the seam allowance open. Measure the width and length of the bottom of your bag where shown. Cut the base 1” shorter than the length and the same width as the cut-out corners. Keep the base 1/2″ from the cut edges of the project to accommodate seam allowances. Because Candice is a large-ish bag, I used two layers of Stiff Stuff. In this case, I just cut one long piece and folded it in half. Use one layer of Stiff Stuff for small to medium sized bags. Use two layers for larger bags. When using two layers, add a bit of glue/tape between the layers just to keep them together during stitching. 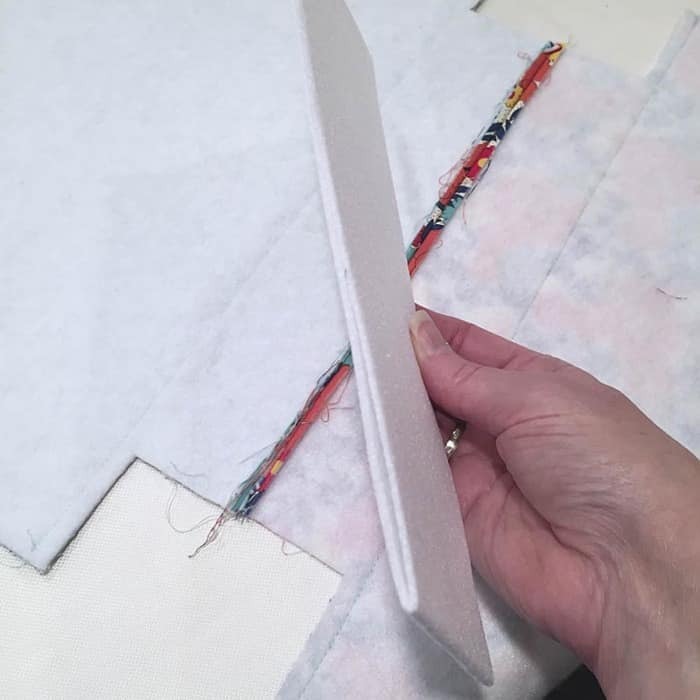 Lengthen your stitch to 3.0 to accommodate sewing through all the layers. Stitch 1/4″ from the edges of the Stiff Stuff. 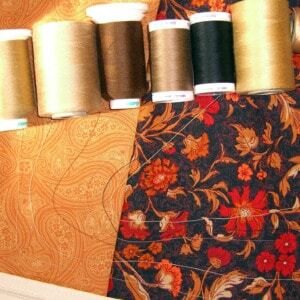 Stitch through all layers to attach the base to your project. Tip: You can use double sided tape or a bit of glue to hold the base in place while sewing. Finish the side seams and box the bottom corner seams. You can see the Stiff Stuff is safely away from the seams. Stiff Stuff is flexible enough to easily turn the bag right sides out. 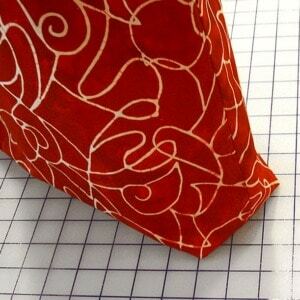 Follow my free tutorial to easily master how to Box the Bottom Corners of a Bag. The stitching will show on the outside bottom of your bag. 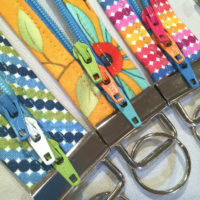 Tip: use a thread color that coordinates with the fabric. 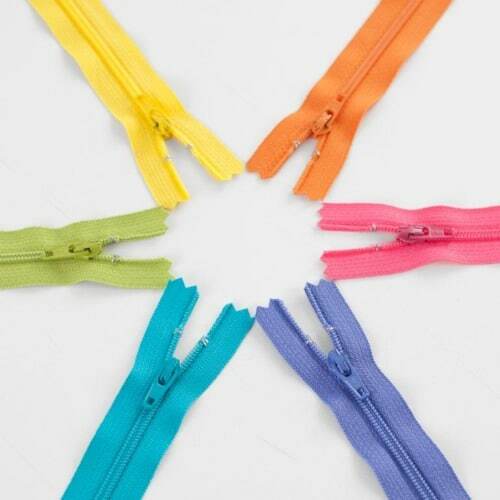 This simple trick of sewing the Stiff Stuff interfacing into your bag provides stay-in-place support for great posture. Fabrics are ‘Harlow’ from QT Fabrics. 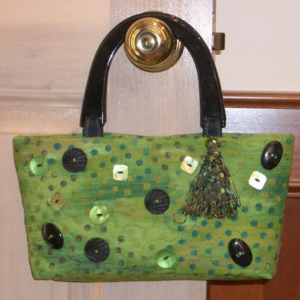 For great results follow my tips for Pressing Your Bag Creations for Professional Results. Want a better ironing board? 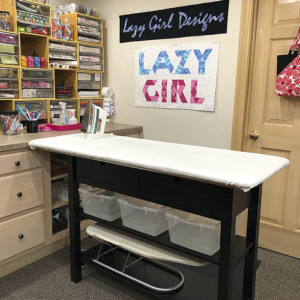 Check out the How to Make the Ironing Board of Your Dreams. 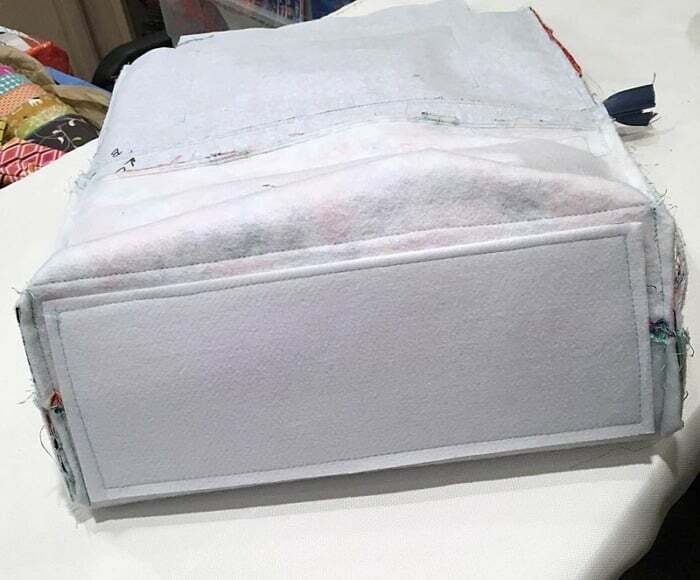 Another way to incorporate Stiff Stuff support is to create a separate false bottom that sits on top of the lining inside of your finished bag. 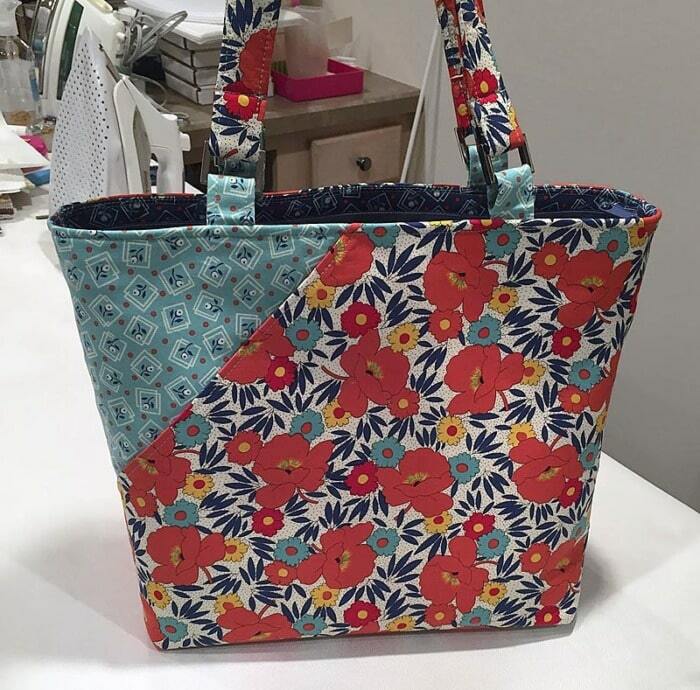 To make, cut to size and cover with fabric, then place inside your finished bag. It will be held in place by the purse contents. Purse feet can be added through the Stiff Stuff for extra stability. 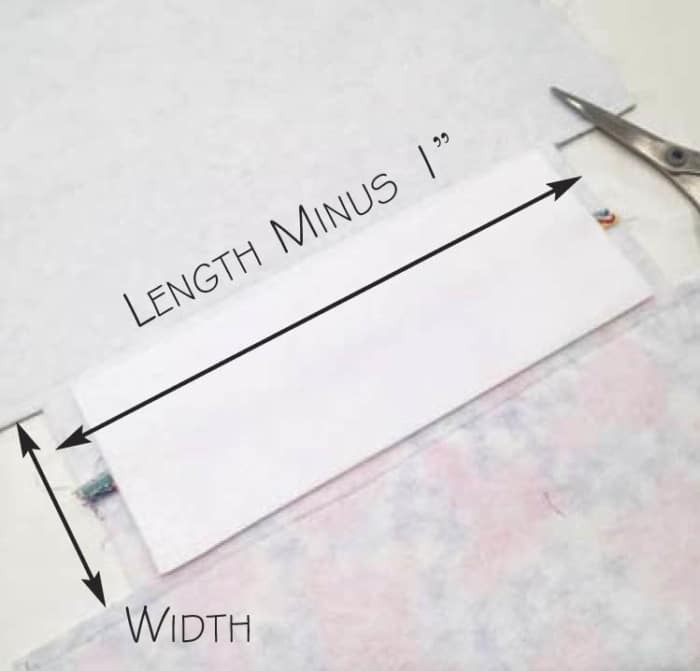 Note – Since our Bag-E-Bottoms were sized to fit our bags, you can simply cut Stiff Stuff to those dimensions and you are good to go! 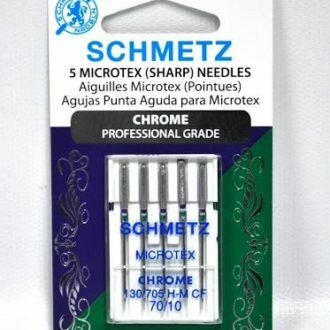 Pre-cut packs of 10″ squares (SLG107SQ). Check your local quilt shop for both. The 10″ squares will work for small/medium bags. Pick up a 1/2-1 yard from the bolt and tuck away so you always have it. Stiff Stuff can be folded/rolled. Press with a press cloth and heat/steam to remove wrinkles/folds. Claim your FREE printable tutorial below! Print it and keep it with your patterns for reference. 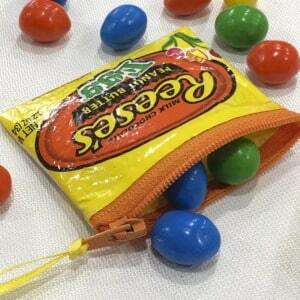 Great bag idea. Here in Australia where I live, single use plastic supermarket bags have been discontinued. I am making several crocery bags and the tutorial will be helpful to ensure a quality result. I like the idea of removable bases as these can be used in several different bags and removed for cleaning. So I subscribed but where is the free tutorial? 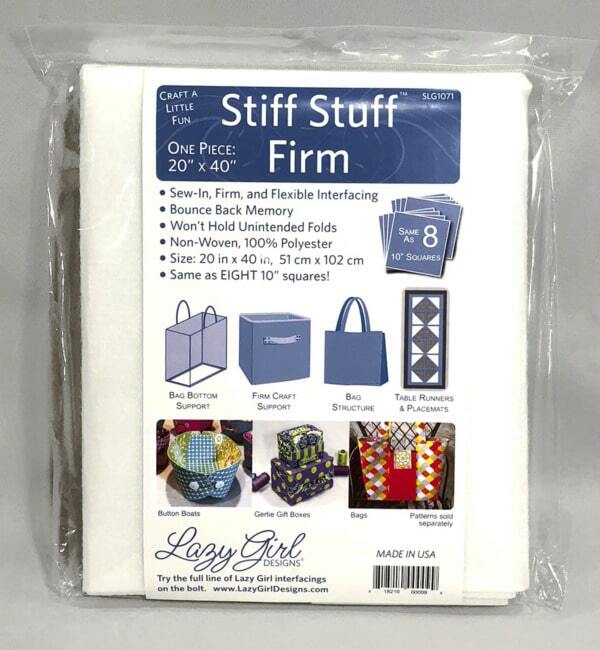 i cannot find a source to order the “stiff stuff” interfacing or the size A or F bag bottoms. Please help! Hi Joyce, Thank you for asking about our Stiff Stuff. Here are two links for purchase options.